Baby chicks grew up fast! 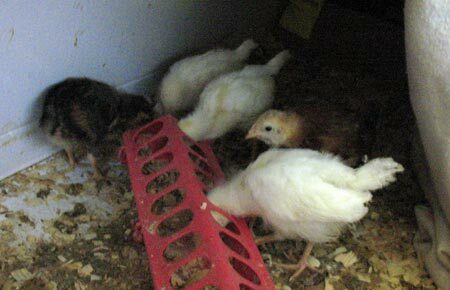 More pictures of the baby chicks as they grew up. They didn’t stay in the cute fluffy stage for very long, getting bigger and looking more bird-like with every passing week. 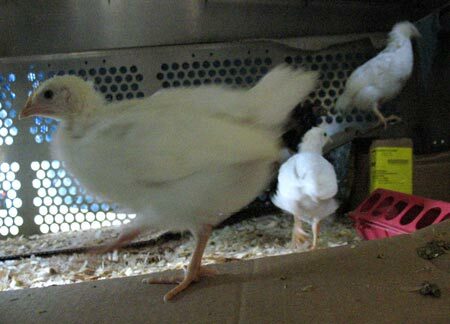 At 31 days old, they were scooting around quickly, peeping almost incessantly. They were getting harder to catch and hold, too. The visiting camera scared them at first and they ran to huddle in the darkest corner of the chicken tractor for protection. 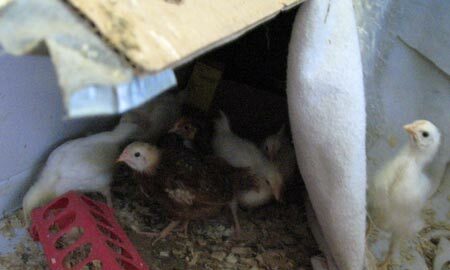 Most of the baby chicks huddled up safe in their corner of the tractor. Anytime is feeding time when you’re a growing chick. Chicken feed is inside the red container. At my visit one week later, I lifted the lid of the chicken tractor, and one chick flew up to the top of its water jug, startling me. At 38 days, the little birds can fly! 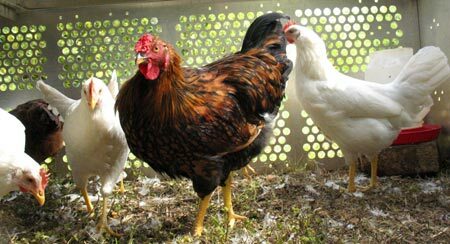 They are looking leggier and more hen-like, with their little combs forming. Definitely at that awkward teenage stage, with their heads looking a little out of proportion to their more fully formed bodies. The growing birds are showing curiosity about the camera instead of running and hiding. Or maybe they just want more food! One of the few pictures where a chick wasn’t a blur in motion. Instead of timid, the chicks are curious about the glass eye spying on them through a hole in the tractor. At the next photo session three weeks later, the little birds are much bigger at 59 days. 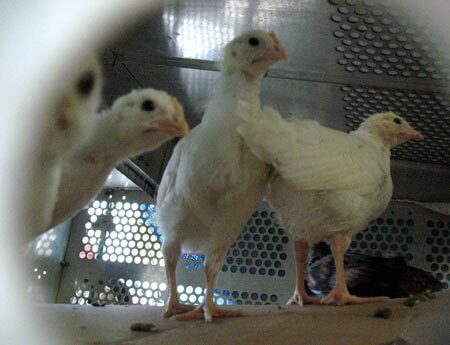 There’s no mistaking looking at them that these are young chickens. Their combs have grown a bit. There’s not as much racing about going on, either, and their voices changed from peeping to something a bit deeper. 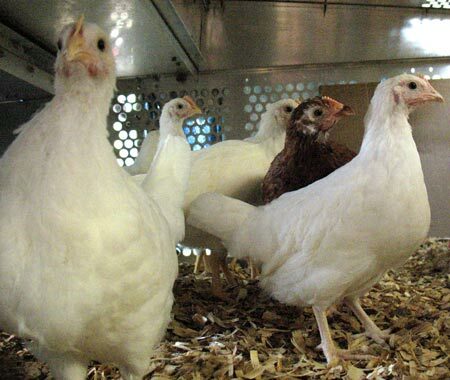 The white birds are Leghorns, the brown blur is a Rhode Island Red, and the other dark one is a mystery breed. Getting the eye from the young leghorns. At the most recent visit, my bird friends are 108 days old, or four and a half months. Farmer Margie calls them the “young ladies.” They certainly look all grown up, with their combs and wattles. 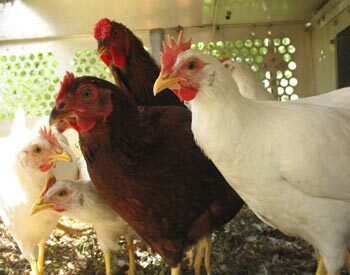 They strolled about instead of racing and peeping, and they speak like hens, buk buk buk. 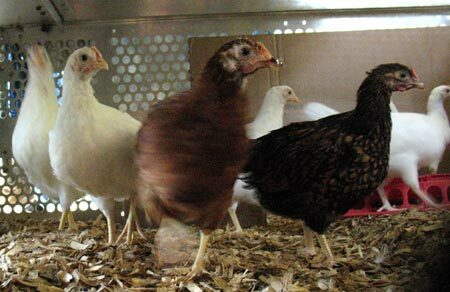 The big brown one definitely looks and acts like a young rooster, coming front and center to see what the visiting glass eye is up to. He also has a spike feather in his tail, a sure indicator that he is a he. The young rooster isn’t crowing yet that I could tell, but that will come soon. The hens will start laying eggs in a few weeks. Yup, the kids are almost all grown up! Gathering for the family portrait. Egg color is linked to the color of the earlobe. 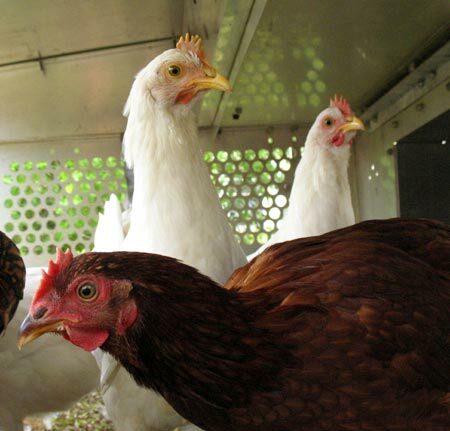 Yes, chickens have earlobes, located just behind the eye. Brown lobe, brown egg. White lobe, white egg. See the spike feather in the brown bird’s tail? That’s a pretty good sign that he might be a rooster. Those are some beautiful pictures! Is that rooster a Wyandotte of some sort? Yes, Golden Laced Wyandotte is a good guess, especially seeing the way his comb is developing.